The snow is back again and it could make the Tuesday night Lower Mainland commute a challenge. Environment Canada has issued a snowfall alert for Metro Vancouver and the Fraser Valley. It says these regions can expect up to five centimetres of snow overnight. 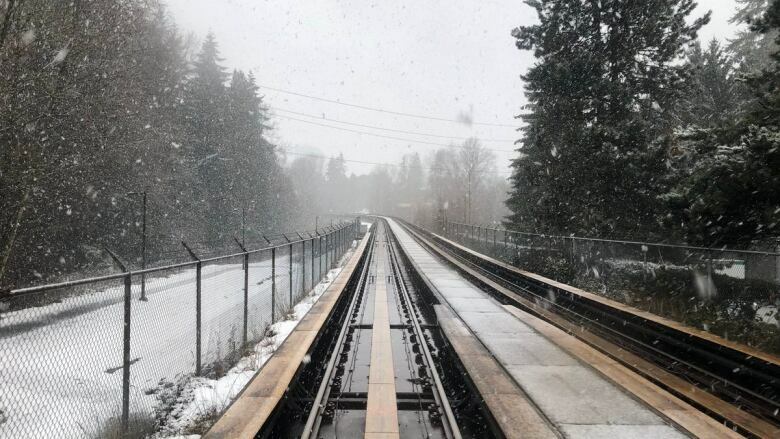 Snow mixed with rain is expected to taper off by Wednesday morning, but TransLink says transit users should prepare for delays. Spokesperson Aliya Mohammed says the SkyTrain, West Coast Express and Handy Dart are operating as normal and buses are servicing Simon Fraser University, but the weather is causing some delays. According to Mohammed, the largest trouble spot is Surrey, where trains and buses are experiencing delays of up to 90 minutes. TransLink is warning riders to plan ahead and dress warmly in case of service delays and to watch for icy and wet patches at transit stations and stops. The snow and sleet can also make it difficult for drivers to see those waiting at stops and in some cases, drivers may have not be able to pull into the bus stop. Riders should keep an eye out for approaching buses that may have to pull over where it is safe and accessible, rather than at designated stops. TransLink will update its Twitter account throughout the night with current conditions and information about delays or service outages.